Numerous nature parks are home to a range of diverse plant and tree species in all seasons. Numerous parks are home to a range of diverse plant and tree species in all seasons. Each park is unique due to the environment in which it is located. Explore them and they will reward you with their mysterious beauty. Enjoy the treasury of nature in Slovenia’s only, yet undeniably incredible, national park. It was named after Mt. Triglav, the tallest Slovenian peak (2,864 m). Embraced by an idyllic Alpine landscape, visit glacial valleys, inviting villages, verdant forests, Alpine flowers, and mountain pastures. A maze of underground galleries and a view of halls with wonderful stalactites and stalagmites will reveal to you an underground world like you’ve never seen before. The Škocjan Caves are a natural phenomenon, unique in the world. This, the deepest and largest subterranean canyon in the world, is one of our planet’s most breath-taking wonders. Take a hike through the underground splendour which was put on UNESCO's list of world heritage sites in 1986. Learn about the tradition of manual salt production that still utilises methods dating back over 700 years. When you walk past the salt pans, the trail takes you by expansive meadows of saline-loving halophyte plants, which provide a refuge for an impressive number of birds. Old, abandoned and demolished houses give the salt pans a unique ambience. A visit to the museum reveals to you how families once lived here and produced salt. At the doorstep of the capital, only a few steps from the edge of the city, you can take a hiking or biking trip to the Ljubljana Marshes. See a landscape that is richly steeped in history. The people of the pile dweller culture once lived here in small houses built on piles raised above the water that once occupied the area of today’s marshes. Slovenians are in love with their green and geographically dynamic land, so they make efforts to conserve biologically rich and picturesque corners of nature. This is also proved by 48 major protected natural areas and nature parks, 52 natural reserves, and more than 1200 natural monuments. You can also fall in love with our green country. Enter a world in which time stops and you can take a moment for yourselves to enjoy genuine natural beauties. Lovers of varied views will surely spend at least one day here or, better yet, a week-long holiday. Take a walk along the shore of the intermittent Lake Cerknica or learn about age-old customs during a panoramic horse-drawn carriage ride. Wonder at the underground world and hike up to nearby hills. Breathe in and enjoy! The picturesque Polhov Gradec Hills invites those who seek beauty. Walk across green peaks adorned with lovely little churches, visit small settlements with solitary farms and large meadows where you can reach out and touch the medicinal plants and protected plants. Lovers of plant and animal species can find paradise here. The landscape is covered with blooming meadows, orchards, vineyards and streams. Explore archaeological sites, pilgrimage churches, mighty castles, medieval squares, and allow your imagination to run wild. Treat yourself to a ripe Kozjansko apple, as you are among the most important orchards, filled with venerable apple trees. If you find yourself in the middle of the city and want an active break, this is just the place for jogging, tennis, swimming, or a walk. Tivoli Park is the green heart of Ljubljana. In addition to old trees and colourful flower beds, it is adorned by various statues and fountains. Walk through the Jakopič Promenade in the central part of the park and see the outdoor photography exhibition that is currently on display. Feel the harmony of natural energies. The natural environment is connected to a carefully designed cultural landscape. The Arboretum is one of the most important pieces of garden architecture heritage in Slovenia. The abundance of various plant and tree species invites you to relax. Take a stroll, and you will surely learn something new about nature and about yourself. In the middle of Ljubljana, tradition and botanical knowledge have been intertwined since 1810. See the plants that are endangered in the wild or have even become extinct in Slovenia. Lovers of special plants can visit the tropical greenhouse or purchase select seeds. The Botanical Garden also boasts its own seed bank. While walking through the herbal and the Japanese gardens and the rock garden, you will be able to see various indigenous fish species that live there. Mozirski Gaj is also known as the flower park, as it is noted for its millions of different flowers that make such a magical display within this charming green space. Don’t miss the blooming tulips in the spring. Everyone looks for pleasant refreshment on hot summer days. Find it in the unspoilt nature of green Slovenia. An abundance of protected areas, which account for no less than 13% of Slovenia, await you! One national park, three regional parks, 34 landscape parks, 66 nature reserves, and more than 1200 natural monuments are just some of the reasons for you to come and find peace and relaxation as you admire authentic natural beauty. 24,000 animal species live here, and some of them are very rare or even endangered. You can also learn about the wealth of Slovenian protected areas actively – on foot, by bicycle, in a kayak, on horseback, etc. Are you ready for experiences in Slovenian nature parks? Nature parks cover more than ten percent of Slovenia’s territory. Aside from the maintained parks, Slovenia offers plenty of scope for heading out into unspoilt nature, be it for a walk, a hike into the hills or a bike ride along the numerous cycle paths. Have you seen the oldest grapevine in the world? Do you know where the human fish lives? And where you can tour a mercury mine? Slovenia is full of special features, and the distance between locations is relatively short. Choose relaxing experiences in Slovenia’s nature parks. Come and have a refreshing encounter with unspoilt nature! Share your photos and clips of Slovenia’s nature parks with #ifeelslovenia. If you wish to enjoy some peace and relaxation, if you wish to enjoy natural beauty, go to a nature park. 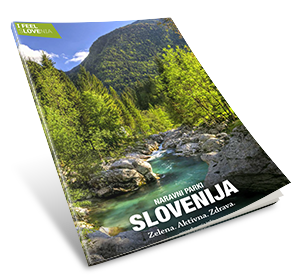 This engaging catalogue features the most beautiful Slovenian parks, along with all the necessary information.